There is nothing like a challenge that motivates me. As if life is not hectic already, there is another thing to add spice to the whole thing. After having so many cookbooks, filed paper clippings, I thought I should browse through them more than anything else. My collection is about 3 huge files, two draw full of cookbooks, and about 4 hand written dairies. This led the new event Cooking from Cookbook Challenge. I am lucky in having friends, who not only motivate me, appreciate my madness, but join my ventures as well. So when I announced this challenge, I had a ready group who were as enthusiastic as I was on this theme. going to cook offline content and stuff the net with more information. I had to end up making this simple curry for lunch. Check the Cooking from Cookbook Challenge and join us if you are interested. For the first edition, this is a typical side dish made with Tamarind rice, from a paper clipping dated a decade back. Wash and slash the potatoes, MW for 10 mins. Soak and peel the skin off. In a non stick pan, add oil, temper with curry leaves, mustard seeds, urad dal, hing, saute well. Then add finely chopped onion julienne, cook till the onions turn colour. Add the tomato pieces, salt and turmeric. Simmer and cook till the tomato is cooked well and soft. Now add the tamarind extract, red chili powder, coriander powder, continue cooking for 5 mins. Add the cooked potatoes, mash well. Add 1/2 water and bring to boil. Switch off and remove when the potato is mixed well. Check the Cooking from Cookbook Challenge page for details of other bloggers doing this with me this month. Potato curry looks so tempting . The potato curry looks awesome! 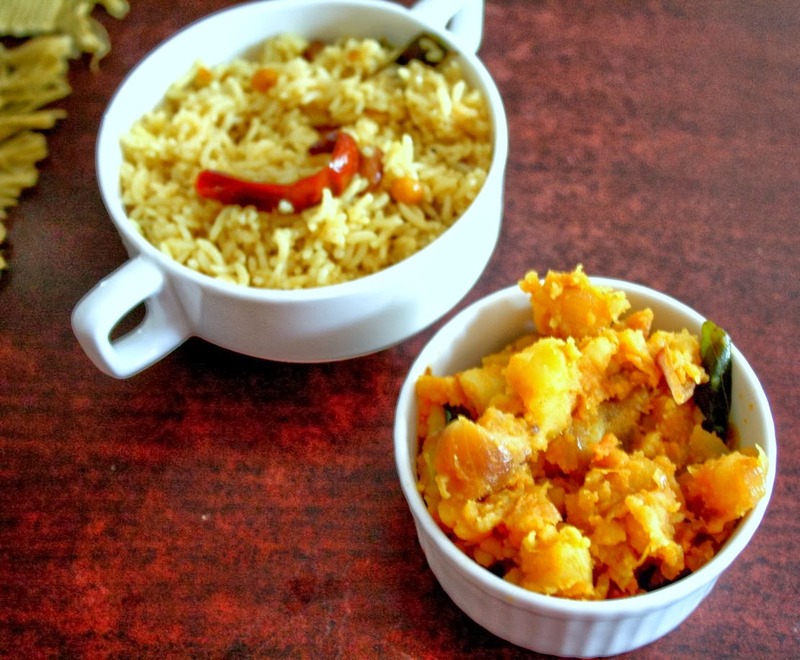 Sometimes simple dishes taste divine and am sure this is one of such dishes. Curry must have an additional tanginess from both the tomatoes & tamarind extract and must have tasted very good. 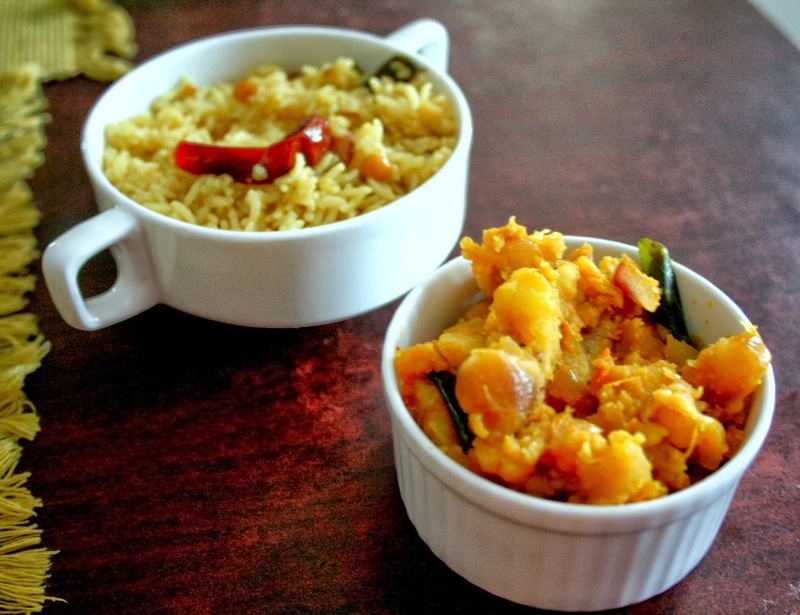 Yummy curry….and the click is definitely inviting too!! Tamarind and tomato in potato curry, thats truly very tempting. My husband LOVES potato and any new variation is welcome in our house. Hope the kids are back to normal Valli. potatoes in any form will be everyones fav cant go wrong with this veggie. I loved the ingredients in them nice curry. My favorite curry! Works so well with several dishes!